This pretty and inspirational silver necklace reminds the wearer to tap into their inner magic. The wearer of this pretty and inspirational necklace will tap into their own personal mojo every time they remember its motto: "Magic is believing in yourself, if you can do that, you can make anything happen." Mary Steratore artfully combines a wire-wrapped tanzanite (the stone of magic), a sterling silver "Believe" charm, and a gold vermeil magic wand on an 18" sterling silver chain to create this enchanting keepsake pendant. Included with each one is card detailing the meaning behind each stone and charm. Handmade in Pennsylvania. My 17 year old neice attempted suicide 2 weeks before Thanksgiving. When I saw this I cried, and knew I had to get it for her. That way if she started feeling alone, I needed her to believe that she had people out there that loved her, and cared about her and if she didn't believe that, at least believe that I did! My hopes are high for her to heal so she will return to my smiling happy bubbly niece that I know is in there somewhere. And get out of the dark hole that she is in. She hasn't taken it off since I gave it to her at our Christmas on the 20th. I wrote a very nice note along with this gift to my niece. She did not receive it and actually didn't even get information on who it was from. 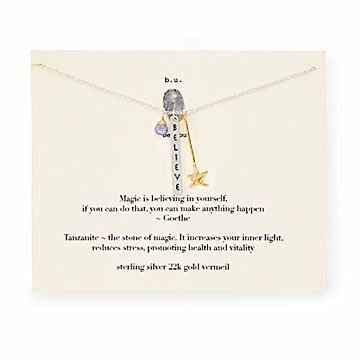 I searched a while for a "just-right" HS graduation gift for a special young lady; this Magic Is Believing In Yourself Necklace was perfect for her in so many ways b/c of her music & theater background (and love), talents, life & career goals, etc. I live too far away to see her for her graduation, so I had this item gift-wrapped and sent to her home. The thank-you card she sent said it all: she was ecstatic with this necklace - which is unique and very meaningful to her on so many levels - and she commented on its meaning, beauty, and uniqueness...and also said she will wear it on graduation day. Her mom was also very happy with this gift. Am very pleased that this hit the mark so well with its recipient. There were many similar items to choose among; maybe another will be just as special for someone in your life, or for yourself. I haven't taken this off since I got it! I just keep reminding myself I need to believe in my magic! Looking for a different personal gift . I liked the quality but the necklace was a little too short. Got this as a graduation gift for someone, she loved it! Perfect gift for collage-bound grandauther. See story behind this gift, above. Perfect gift for someone who has everything jewelry-related! I highly recommend this product; I'd buy it again.